The 2018 Hyundai Elantra GT is a great option for those who want an affordable vehicle that delivers the versatility they need for their daily lives. This is the hatchback version of the popular Elantra sedan, and it comes with a low starting price. It is also all-new for 2018, meaning that you can get a vehicle that fits your budget and has the latest features and styling. The starting MSRP for the 2018 Elantra GT is $19,350, letting this Hyundai appeal to a wide range of drivers. When buying the 2018 Hyundai Elantra GT, you will find yourself with the choice of two trim levels to choose from. There is the base Elantra GT and the Elantra GT Sport. 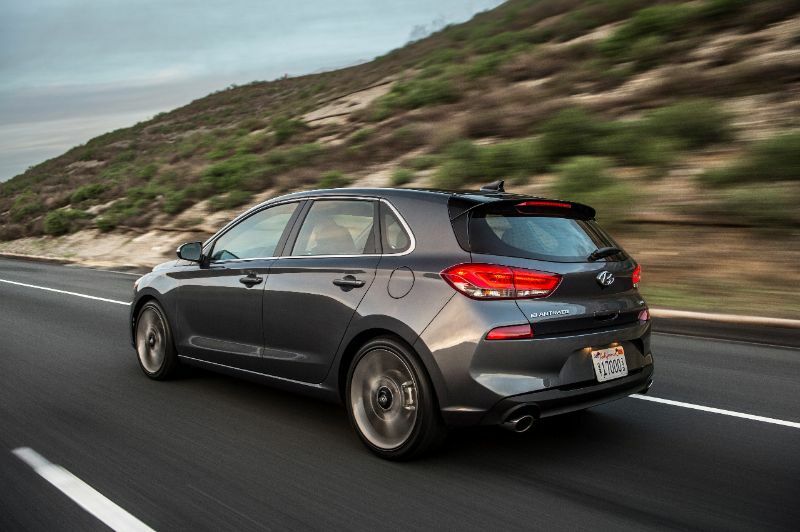 Key features of the base Elantra include the 8-inch display audio system and 17-inch alloy wheels. The GT Sport upgrades the engine and adds 18-inch alloy wheels, a multi-link independent rear suspension, larger brakes, Lane Change Assist, Blind Spot Detection, and Rear Cross-traffic Alert, but it does increase the starting MSRP by a few thousand dollars. As a hatchback, it should come as no surprise that the 2018 Elantra GT delivers versatility. When you fold the rear seats down, you will find yourself with 55.1 cubic feet for cargo. 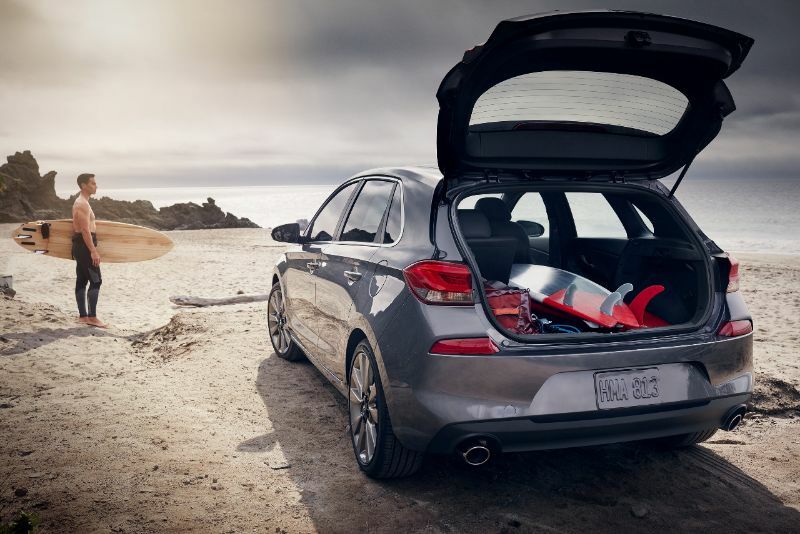 To easily let you make the most of that space, the rear seats split 60/40 in the Elantra GT. The wheelbase on the Elantra GT is slightly shorter than that of the sedan version. Therefore, rear-seat passengers get an inch less of legroom. In terms of features, all Elantra GTs get Apple CarPlay, Android Auto, and an 8-inch touchscreen. They also get height-adjustment for the driver’s seat, Bluetooth, and a rearview camera. You can also get leather on the steering wheel, power-adjustment and heated seats in front, and a panoramic sunroof. Want even more? Add in ventilated front seats, wireless charging, navigation, and Blue Link. 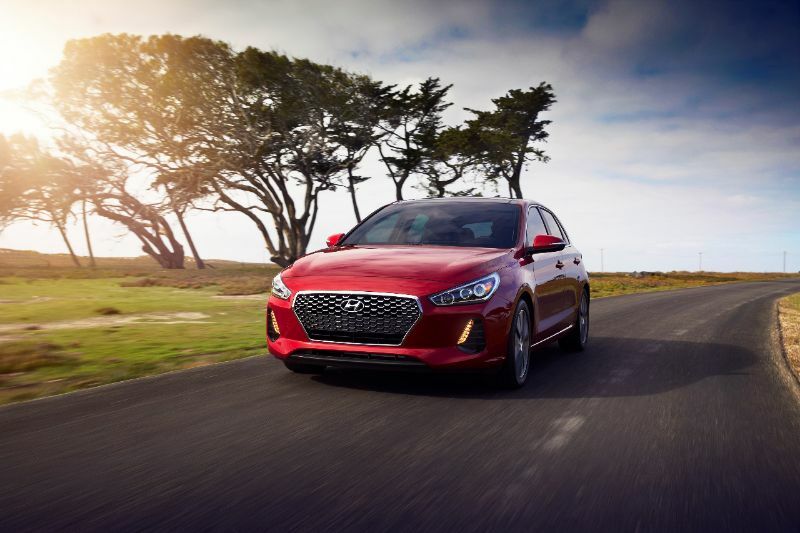 Due to its compact size, the 2018 Elantra GT delivers good fuel economy. The base version uses a 161-horsepower 2.0-liter GDI engine that gets 26 mpg combined. That’s 23 mpg in the city and 31 mpg on the highway. The Elantra GT Sport has a 201-horsepower, 1.6-liter turbocharged GDI engine for 25 mpg combined. That includes 22 mpg in the city and 29 mpg on the highway. If you choose, you can configure the 2018 Hyundai Elantra GT to include a long list of advanced safety and driver-assistive features. These include Smart Cruise Control that has stop/start capability, Blind Spot Detection featuring Rear Cross-traffic Alert, and Lane Keep Assist. You can even get Driver Attention Alert and high-beam assist. To put this in perspective, the Elantra GT is the only auto in its class with available Driver Attention Alert, making it a smart choice for those on a budget who prioritize safety. As a Hyundai, you get even more affordability from the 2018 Elantra GT over time via America’s Best Warranty. Like all other Hyundai’s, the Elantra GT comes with a 60,000-mile or 5-year New Vehicle Limited Warranty, a 100,000-mile or 10-year Powertrain Limited Warranty, and 24-hour Roadside Assistance for 5 years and unlimited miles. Between the warranty and roadside assistance, the savings with this hatchback continue to add up.